I recently had the privilege of becoming a board member of Time Angels. A skills-based volunteering platform to help Startups achieve their vital missions. Our first Angel board meeting was with Surf Agency. 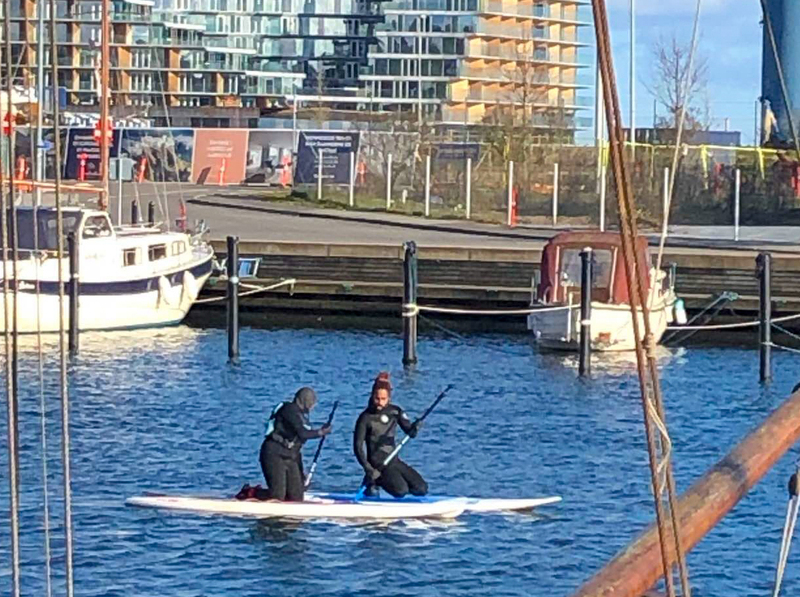 An Aarhus based Standup Paddleboarding company, run by Finja Götz and Michael Allman. 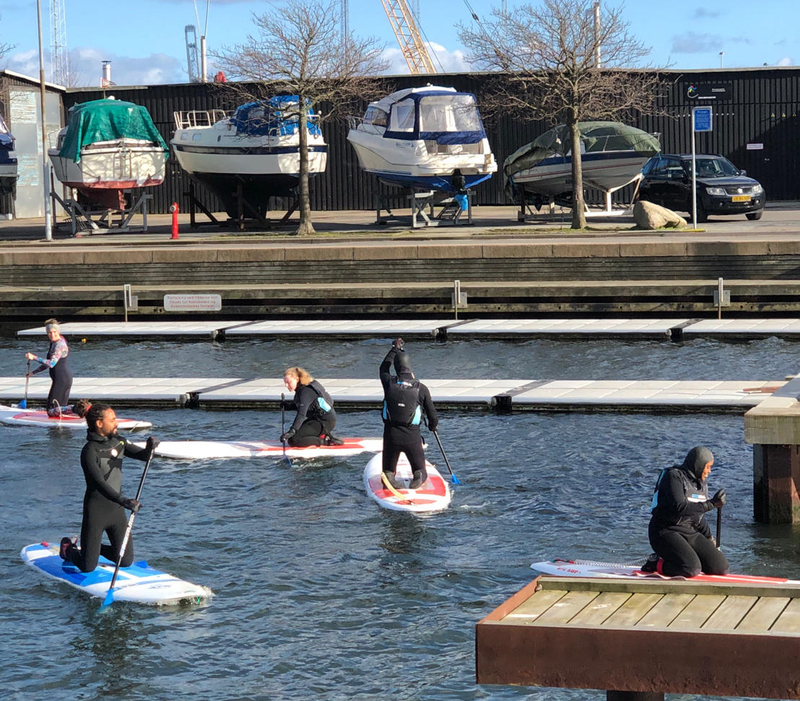 The Agency’s presentation included a hands-on StandUp Paddleboarding experience in Aarhus harbour. As a Taurus woman, I am not one to chicken out of new experiences. However, the thought of going out to a deep, dark, body of water, triggered a familiar sense of dread. I am scared of deep waters; this fear stems from a traumatic near-drowning experience when I was a child. As with anyone who has had a traumatic experience, I raised my hand and admitted my fear of open water swimming. I wanted to opt out, but my husband had earlier encouraged me to carry my swimsuit and give the experience a try. Michael and Finja also reassured me that I would be good hands once we ventured into the sea. I took a deep breath to silence the gremlins of self-doubt. Laughter often works for me as an antidote to stress triggered activities. Thus I humoured that we looked like a bunch of Navy SEAL divers, on a mission, clad in full body wetsuits. 2019 is my year courage. My goal for this year is to overcome or master self-doubt. I am on a mission to fulfil my purpose and goals beyond the fickle gravity of fear. While Finja gave us a rundown on the main techniques of paddleboarding, my internal critic was whispering, ‘this looks nice in theory, but wait until you get to put into practice. You will know why chickens can’t fly’. With trembling knees and a positive attitude, I mounted the paddle board. Aware of the depth below, but trusting the company of Michael and Finja. ‘Remember, the board and paddle are your best friends; they will take care of you once you start paddling.” Michael reassured me. The beginning of the kneel down paddleboarding was shaky. I focused on the mysteries beneath dark waters, and as a result, I slipped and fell. I tried to lift my weight onto the board but failed. I was kicking the water in panic and fury, forgetting that I had put on a life vest. Furthermore, I needed to remind myself that, courage is not the absence of fear. Courage is when fear is there, but it’s not holding you back from doing what you want to do. His words reminded me of the intense scene in AVATAR. When Jake Sully finally tamed the wild Banshee. His courage proved that limitation is only in your mind. Even though I slipped up and fell more times than I care to count, I got back on the paddle board. I pushed myself out of overthinking or being apologetic of my clumsiness. After finding balance on the kneel-down paddling position, I felt that I was ready to try the stand-up paddleboarding. By now, my legs felt like jelly. I managed to stand up by keeping my head up, eyes straight into the horizon. The same analogy applies to life. Everything you do requires balance; wherever you look is where you will go. Keep looking forward. Above all, paddleboarding was about moving from insecurity into feeling secure, and confident. In the end, I chose to focus on the magic of the sea, the warmth of the sun and the wind against my face. I felt disconnected from my fear, and intoxicated with happiness: I was over the moon. Surf agency’s business mantra is passion, professionalism and a personal touch.